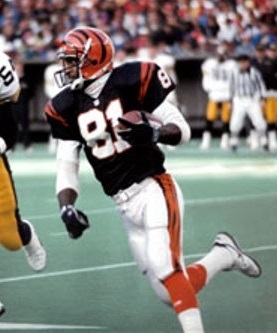 Following an outstanding college career in which he was part of the 1983 National Championship team and caught 59 passes for 1114 yards and 9 TDs in ‘84, Brown was chosen by the Bengals in the first round of the 1985 NFL draft (13th overall). The retirement of 12-year WR Isaac Curtis opened a starting spot across from fifth-year veteran Cris Collinsworth, and Brown moved immediately into the lineup and caught 53 passes for 942 yards (17.8 avg.) and eight touchdowns. He received NFL Rookie of the Year honors from NEA and The Sporting News and Offensive Rookie of the Year recognition from the Associated Press. Having added to Cincinnati’s explosive passing offense in his first year, Brown accumulated 58 catches for 964 yards (16.6 avg.) and four TDs in 1986 and, in the strike-interrupted ’87 season, had another 44 receptions for 608 yards (13.8 avg.) and three scores. Bengals went 12-4 to finish first in the AFC Central while leading the NFL in total yards (6057), rushing yards (2710), touchdowns (59), and scoring (448 points). Won AFC Divisional playoff over Seattle Seahawks (21-13) and AFC Championship over Buffalo Bills (21-10). Lost Super Bowl to San Francisco 49ers (20-16). Brown played another three years, following up with 52 catches for 814 yards (15.7 avg.) and six touchdowns in 1989 and pulling in a career-high 59 receptions for 827 yards (14.0 avg.) in 1991. A neck injury cost him the entire 1992 season and effectively ended his career. While criticized for dropping passes on occasion, his big-play ability was undeniable. Over the course of his seven seasons with the Bengals, Brown caught 363 passes for 6134 yards (16.9 avg.) and 41 touchdowns.